If you're considering a degree in business, you should first consider your intent and goals. The broad range of business skills and topics can lead to just about any career inside or outside the business world. So make the most of a business degree by knowing what you want to do with it. If you take a step back and look at human history, it becomes clear that business has been at the center of our societies from their earliest days. Some might even say that the continually dynamic exchange of goods is the cornerstone of our development into massive civilizations and the emergence of our modern world. And business shows no signs of fading away. In fact, business stands at the forefront of innovation and progress. Business is our link to the past and our guide to the future. Are you interested in jumping into the global market? Is a degree in business right for you? As with any degree, there are several things to consider. Two of the most important considerations for international students thinking about seeking a business degree in the US are your interests and your goals. While these two things are important considerations for just about any degree, their importance is heightened when it comes to a degree in business due to its wide applicability. In other words, the business field is so broad that you'll need some kind of direction to avoid getting lost. So why are you interested in business? The allure of the marketplace? The fast-paced lifestyle? The chance to travel the globe? And what are your career goals? To start your own business? To work your way up to the top? To make life easier for people around you? There are so many options available by entering the various business fields that just about any personal vision can be accommodated. So is a degree in business right for you? Think about your interests and your goals to see if they align with studying business. What can international students actually get out of a degree in business? Graduates with a degree in business have an inside track to the American dream. The US was built on the ideals of starting your own business and that ideal remains a motivating factor for the US and global economy today. A business degree in hand gives you an instant advantage to establish yourself among the competition. Building or running a business certainly takes some natural talent, but immersing yourself in the knowledge of business management, for example, can take that talent to the next level. Additionally, a degree in business is applicable just about anywhere. Since the exchange of goods happens in every corner of the country and every corner of the globe, you can take your business skills just about wherever you want. If you happen to specialize in international business, you can make the whole world your office. Indeed, part of the fun of getting into business is seeing where it will take you! Finally, and most importantly, a degree in business gives international students a set of skills that can lead to a variety of careers in and out of business. 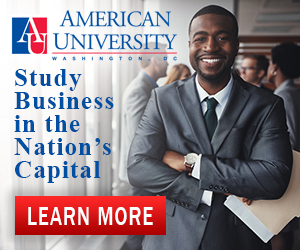 Need more reasons to study business? First, a business degree program will teach you critical thinking and problem solving skills ranging from balancing a budget to weighing marketing mishaps. Your mind will be sharp and quick to deal with tough situations and find the smoothest way out. Second, you will learn the finer points of data analysis. On the surface, business may just look like exchanging material goods, but any good businessperson knows that underneath it all are numbers. Knowledge of statistics, patterns, and economic formulas help businesses make the most out of their production. Third, business degree programs teach communication skills. No business can operate with one person alone and no business can succeed if it doesn't have clients and consumers. Thus, people skills, negotiation skills, and even hospitality skills are essential for the smooth operation of modern business. Fourth, you will learn how to engage in in-depth research. A successful business takes in all of its surroundings, both physically and economically, in order to maximize its production and its profit. Without knowing what the world needs, how can you help to make it? Fifth, top tier business degree programs will even encourage the development of creativity. What better way for international students to succeed in the global marketplace than to create a truly novel product, idea, or model? The double benefit of all these skills is that they transfer to many different types of careers. So if you're asking yourself, “why study business when I'm not sure what I want to do yet?”, the answer is that a degree in business is perfectly suited to help you in any career! Is a degree in business right for you? That depends on your interests and your goals. International students should consider what kind of career they want and where they want that career to go before settling in on business degree. Why study business? Because it gives you an advantage in entering the global marketplace, and, even if you don't want to dive into the business world, it will give you a valuable skill set that translates into multiple careers.